Appraising duck hunting properties is a fairly difficult undertaking due to the many different variations of property characteristics. However, every good duck hunting property needs the same basic features, and these features are the greatest factors in valuing the property. Such properties need the ideal location near a flyway and population center, adequate wetland, and a good food source for the ducks. Most often a duck hunting property is located in a river bottom near what is called a flyway, a route regularly used by large numbers of migrating birds. Ducks and other birds that migrate south in the winter are looking for places to rest and eat when flying. Very rarely do the large rivers completely freeze, which make them great places for ducks to land and feed. By contrast, bird activity is minimal in places which are further away from such flyways. The map below shows the location of the rivers in and around Missouri and their flyways. 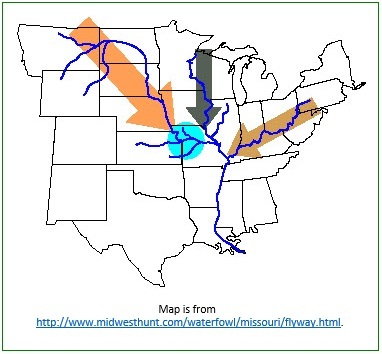 The major rivers in central United States all appear to flow into the Mississippi River around Missouri, making this area very good for duck hunting. However, the value of a duck hunting property is determined not only by close proximity to a flyway, but also by close proximity to population centers. Many buyers do not want to drive several hours to their properties in order to hunt. They want to leave the office early and be in their blinds within an hour. Because of this, many properties located in close proximity to St. Louis (so long as they are easily accessed) have a higher value than those located further away. Adequate water is another necessity for a good duck hunting property, and various methods are used to keep ponds flooded. Most of these properties are deliberately flooded using wells. These wells are costly to install and use electricity to run, but they give the owner a lot of control over the water level, and the piping under the water near the blinds helps to prevent freezing. These wells help to make the property more attractive to traveling ducks. Another method for flooding the property is the diverting of water from a natural waterway, such as a ditch. However, the success of this type of water source is dependent on rainy weather. Since many hunters do not want to put this kind of faith in Mother Nature, this method is not commonly used and wells are preferred. Often property owners think that a duck hunting property is made more valuable by having more wells. This does not appear to be the case in the current market. Most of the time, the higher number of wells on a property indicates a greater problem with seepage. The ponds are probably really sandy or leaky in one-way or another, and more water is needed to keep the ponds filled. But as long as the property has adequate water and retention, the value of the property is not altered by number of wells. The best duck hunting properties will also try to provide a food source to attract a large number of ducks. The owner typically drains a pond, opens the spillway, and allows the ground to dry. 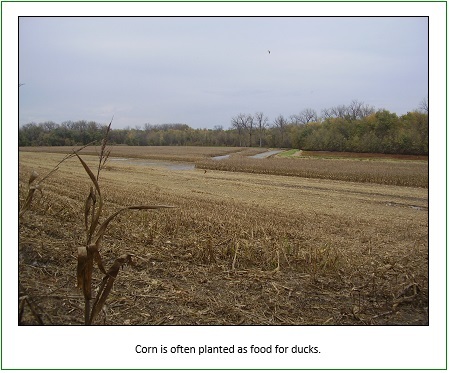 A crop, typically corn, is planted and allowed to grow to its maturity, which happens around the time duck hunting season begins. Then the spillways are closed and the ponds are flooded so that the ducks can land and eat while floating on the surface of the water. Difficult appraisals such as duck hunting properties do not discourage the professionals here at Spurgeon Appraisals. We will work hard to determine the value of each of the unique characteristics of your property. Call today and let us help you with your appraisal needs.